Posted August 30th, 2005 by Ms. Jen & filed under news + events. 1) Freckles is mending from the removal of the humongo sarcoma cancer tumor that was removed from his right rib side almost two weeks ago. He is resting lots, taking small walks and the tumor has not returned. Best of all, he is more alert and awake than he has been in two years. He must like his daily morphine. Our dog, the junkie. He is even taking the time and energy to intimidate Scruffy. 2) Scruffy has recovered fully from his fall and head bonk at Erika’s shower. Scruff is back to his fully active skirmy self. Good news. 1) I have been accepted into a Hall on Trinity College for housing. My space will be a “single ensuite” which translates into a single bedroom with it’s own bathroom within a larger apartment where I will share the kitchen and living room with 6 other folk. Best of all, each room has a Network Connection. Yep, internet happiness. Posted August 29th, 2005 by Ms. Jen & filed under photos + text from the road. Mon 08.29.05 – Allison and I went and got pedicures this morning. Posted August 27th, 2005 by Ms. Jen & filed under news + events, photos + text from the road. All photos taken with Ms. Jen’s Nokia 7610 (the camera that rings). Posted August 26th, 2005 by Ms. Jen & filed under photos + text from the road. 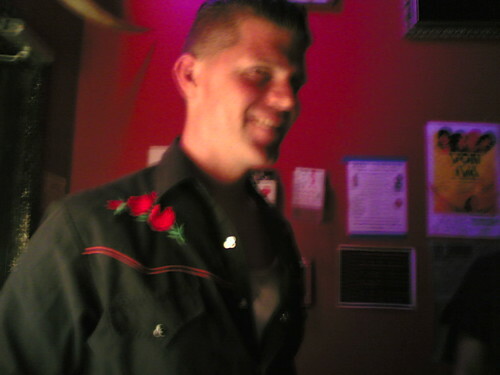 Thur 08.25.05 – Happy Birthday to Dave Irish! 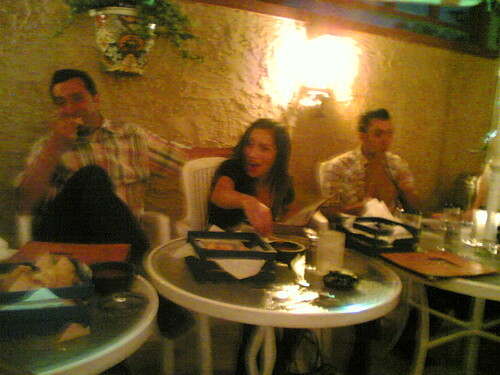 Thur 08.25.05 – Greg, Gina & Matt at Steve Soto’s b-day dinner. Posted August 24th, 2005 by Ms. Jen & filed under news + events. 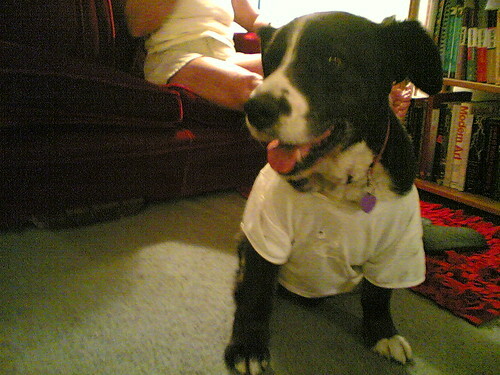 Wed 08.24.05 – Freckles in his recovery t-shirt. Last Wed. Freckles had a huge cancerous tumor cut out of his rightside ribs. He is a trooper. Posted August 21st, 2005 by Ms. Jen & filed under photos + text from the road. Sun 08.21.05 – The reality is another story. This is The Very First Time I have EVER seen Alex wear earplugs. Ever. 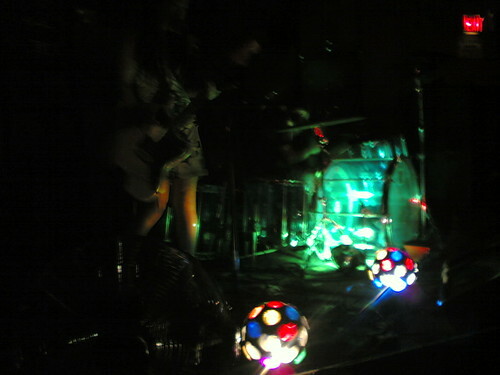 Jucifer = Visually lovely, Aurally excurciating.